Rabbi Margolis was presented to Geiger President Rabbi Walter Jacob by her mother and Bet David’s Rabbi Robert Jacobs who shared in her training in Johannesburg. The historic event coincided with numerous significant anniversaries including the start of World War II on September 1, 1939, the 140th Yahrzeit of the seminaryâ€™s namesake. 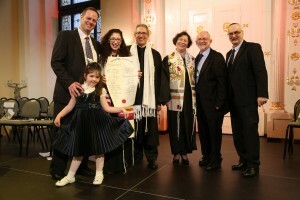 Abraham Geiger and the 15th anniversary of the Geiger College – Germany’s first Rabbinic training institution after the Shoah. Wroclaw was known as Breslau until its 1945 return to Polish sovereignty. In an address by German Foreign Minister Frank Walter Steinmeyer, the specificity of Germany’s historic responsibility represented in strong government support for the renaissance of Jewish life in central and east central Europe, accompanied remarks by Wroclaw’s Mayor at a Memorial Concert on Monday Evening (1 September) decrying the resurgence of Antisemitism and the unsettled climate created in the Ukraine, at NATO’s edge. 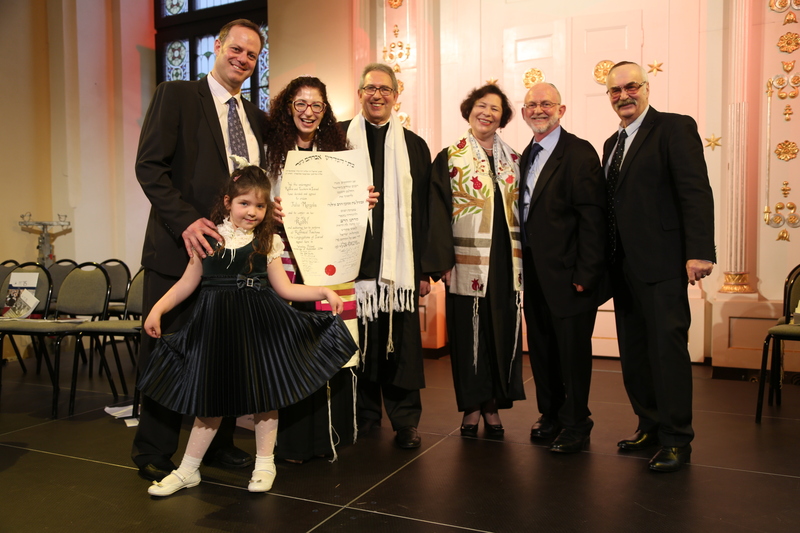 Rabbi Margolis was one of four rabbis Ordained, along with 3 Cantors invested, all trained through the German seminary. Seventy-five years after the German military conquest of Poland, the Abraham Geiger College convened its Service of Ordination in the historic White Stork Synagogue in Wroclaw, formerly Breslau [Germany]. The College ordained four Rabbis and invested three Cantors. German Foreign Minister Frank-Walter Steinmeier (SPD) underscored the enormous political significance this location by his presence. 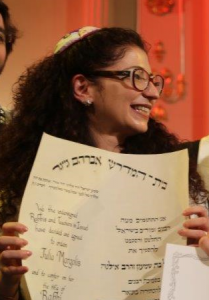 He came specifically from Berlin to offer his congratulations to the seven candidates: Cantors Sofia Falkovitch, Aviv Weinberg and Alexander Zakharenko, as well as Rabbis Julia Margolis, Nils Ederberg, Jonas Jacquelin and Fabian Sborovsky. At the time, the Foreign Minister called to mind the religious meaning of the venue, which served as a centre of Higher Jewish Education until the end of the 1930s. It was clearly impossible to misunderstand Steinmeierâ€™s statement against anti-Semitism, which elicited spontaneous applause. It starts from the miracle that 75 years after Germanyâ€™s military offensive against Poland, Christians, Jews Poles and Germans celebrate this Ordination together, Steinmeier said. The Graduates: The seven graduates received greetings from a representative of the Polish Community, the President of the World Union for Progressive Judaism [Rabbi Daniel H. Freelander] and of the Ernst Ludwig Erhardt Foundation, Charlotte Knobloch. Good wishes from the Central Organisation of German Jewry were presented by Richard Schramm, Chairman of the Jewish State Community of Thuringen, offered in Polish in thanks to the host community. Each of the speakers mentioned the great significance of the ceremony. The Abraham Geiger purposely chose this Polish city for the Ordination Service. Rabbi Abraham Geiger, for whom the Rabbinical Seminary is named, served some 20 years in Breslau. After a seven year term in Frankfurt, he became one of the founders of the Berlin Hochschule fuer die Wissenschaft des Judentums [Seminary for the Academic Study of Judaism] where he taught from 1872 until his death in 1874. 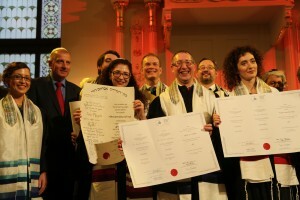 The new Rabbis and Cantors come from France, Paraguay, Russia, and Germany. Going forward, only two of the newly ordained will serve in Germany. Alexander Zakharenko will assume Cantorial duties in Erfuhrt, and Nils Ederberg has strong ties to Berlin. The remaining graduates will be scattered in the wind. For example Jonas Jacquelin returns to his hometown Paris, Sofia Falkovitch is called as Cantor to Luxemburg, and Julia Margolis will go to South Africa.